Author Dr. Robert J. Medford’s Newly Released “Bondservants of God: What We Believe” Is A Candid Presentation On The Beliefs Of Messianic Christians. “Bondservants of God: What We Believe” from Christian Faith Publishing author Dr. Robert J. Medford is a captivating and thought-provoking book expressing the beliefs of Messianic Christians, faithful servants of God, who emulate Christ and believe the Doctrine of Christ is to be followed precisely. “Bondservants of God: What We Believe”: a thought-provoking book expressing the beliefs of Messianic Christians, faithful servants of God, who emulate Christ and believe the Doctrine of Christ is to be followed precisely. 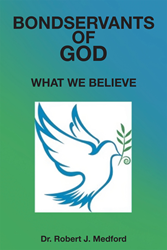 “Bondservants of God: What We Believe” is the creation of published author, Dr. Robert J. Medford. Published by Christian Faith Publishing, Dr. Robert J. Medford’s new book candidly examines the idea of true churches, the various doctrines taught, and the beliefs of the Messianic Christians. There are over three thousand different denominations of the Christian Church in the United States. At least a third of them claim to be the only true church. Many who make that claim say that only those belonging to the true church will ascend into Heaven, everyone else will be lost. How is it possible, that there are so many true churches? Dr. Medford presents thorough research on the doctrine of salvation, the doctrine of obedience, and the doctrine of faith in this book of what a bondservant of God believes. To be a Christian means to emulate Christ. It is the doctrine of Christ that must be followed. If there is just one dogma deducted from the doctrine of Christ or just one dogma taken away, it is not the Doctrine of Christ and cannot be the true church. View a synopsis of “Bondservants of God: What We Believe” on YouTube. Consumers can purchase“Bondservants of God: What We Believe” at traditional brick & mortar bookstores, or online at Amazon.com, Apple iTunes store, Kobo or Barnes and Noble. For additional information or inquiries about “Bondservants of God: What We Believe”, contact the Christian Faith Publishing media department at 866-554-0919.